As we age, every one of us begins to experience some physical dysfunction. Sometimes it is through no fault of our own, and sometimes it is due to the lifestyle choices we have inadvertently chosen. Many of our senior patients seek our care because of the effects of years of physical dis-use. Some are beginning to experience weakness in vital areas; some begin to feel the effects of arthritis and degeneration; some feel a huge loss of vitality due to inactivity and a sedentary lifestyle. We treat every patient that enters our clinic, young or old, as if they’re an elite athlete. This is because all life is about movement, and we want to perfect your movement to a place of peak performance. 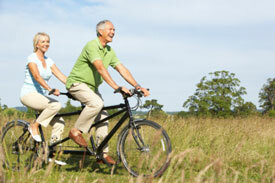 Many seniors, as they grow into their golden years, become increasingly sedentary. However, it becomes vitally important, as we age, that we increase our physical activity. By the age of 70, many of us have already lost about 30% of our lean body mass. One of our senior patients had many health challenges, including a heart problem that required emergency surgery. Following this intervention, she developed an infection in the hospital that kept her immobilized for three months. She was told that she would never walk again. She was referred to our clinic, and began gentle chiropractic treatment and a series of customized exercise regimens to help restore her vitality. She now can not only walk without any assistance, but can climb stairs without getting winded. This could be your chiropractic story…or the happy ending for a beloved parent or grandparent. Our bodies are meant to move, to thrive, to heal, and to excel. We invite you to call our clinic today to start a new chapter in your life!